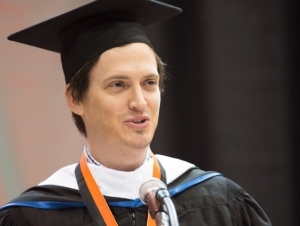 Somehow, Distinguished Alumnus Award recipient Kyle Bradstreet, '02, '04, was taken aback when asked to deliver the address at this year's morning undergraduate commencement ceremony. Not far, of course. For his part, Bradstreet delivered an alternately irreverent and inspiring speech to the 2016 graduates. "Know that it goes fast, so enjoy the ride," Bradstreet told the assembly. "I graduated 14 years ago, but it feels like yesterday I was sitting where you are today. Ambitious, anxious, curious, unsure, but hopeful." Mr. Robot fans are hopeful, too. The show's support community has been champing at the bit since the season one finale. The USA Network show, a psychological thriller that follows the exploits of computer programmer and vigilante hacker Elliot Alderson, played by Rami Malek, has won a Golden Globe for best drama, a Writers Guild of America Award for best new series, and is expected to receive several Emmy Award nominations. Spoilers for Mr. Robot's second season have yet to reveal too much and Bradstreet isn't giving away any secrets. “We feel we have a very strong season on our hands," Bradstreet told the News. "I personally will say we’ve upped our game on the storytelling a little bit. It is one cohesive piece charging forward. We do some pretty crazy things this season." Bradstreet, who earned a bachelor's degree in English with a minor in theater and a master's degree in multidisciplinary studies, used what he learned at Buffalo State to launch a successful writing career. His other television credits include writing and producing the popular BBC-America television series Copper, created by his mentor Tom Fontana, '73, and work on the screenplays for Borgia: Faith and Fear, HBO's Manhunt, and NBC's The Philanthropist. In addition to his television work, Bradstreet is the author of the staged plays Honor Thy Mother, From Prague, and Alcohol, and many one-acts. His fiction writing has been published in several literary journals. Mr. Robot's new season premieres on USA Network at 10:00 p.m. on Wednesday, July 13.